in the Vava'u Group of Tonga"
Tonga produces very little food other than agricultural and fisheries products, so lots of food is imported and it's expensive. Most is brought in from Australia and New Zealand whose dollars are stronger now against the American dollar than they were a few years ago. Tongans love their canned corned beef, so there's lots of choice in brands, if that's your thing. The bakeries in Vava'u sell nice breads, including cheese/onion bread in un-sliced loaves. Arriving from French Polynesia we were glad to still have many non-perishable items on board which meant we didn't have to pay super high prices for paper products, juices, beer or wine, pickles, mayonnaise, mustard, canned beans, powdered milk, rice and pasta. In Vava'a, frozen chicken and meats were available at both Pua's and from an ex-pat Kiwi who imported directly from New Zealand. 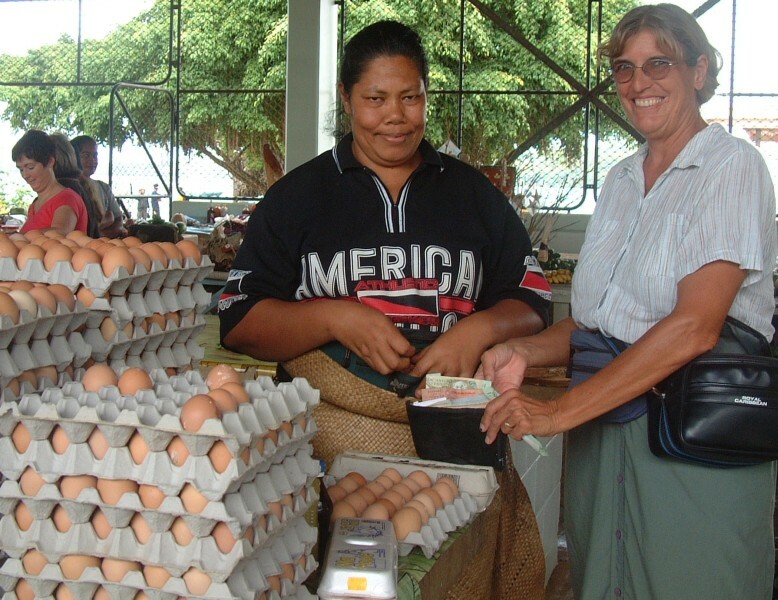 The marketplace in Neiafu, Vava'u, Tonga was open Monday through Saturday, closing at noon on Saturday. Here you could find eggs (at a pricey US$2.50 per dozen), handicrafts, baskets, and an assortment of seasonal fruits and veggies. In the five months we were there (May through September) we saw pineapples, tomatoes, watermelons, avocados, cucumbers and zucchini come in and out of season. 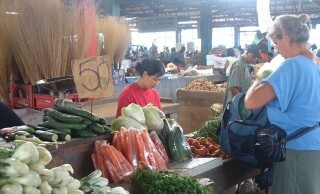 We could always find local onions, bananas, carrots, papayas and cabbage plus expensive imported apples. Pua's grocery store (the most up-scale store on the island) sometimes carried lettuce. Fiji has a big agricultural and food processing industry, so Fijian powdered milk, flour, rice and spices are well priced by my “dollar rule” (see below). Fijian meats are reasonably priced and can be vacuum packed for you at both Fiji Meats (Lautoka and Suva) and other good meat shops. Cheese in Fiji (locally made) is reasonably priced. We like mature cheddar for flavor, so despite the price we try and stock up when we find it. Both Fiji and Tonga import New Zealand "tasty" cheese, which is an aged cheddar. The large East Indian population in Fiji means you can get all manner of beans and lentils, spices (bulk or packaged), mixed curries and masalas, Indian sweets and snacks. Eating out in Indo-Fijian restaurants sets you back about US$4-$8 for a big curry meal. The market places in Suva, Lautoka and Nadi offer an array of very affordable fresh fruits, vegetables, spices, eggs, and the ubiquitous kava root. Prices: We apply the “dollar rule” to quickly determine if a country's food is expensive or not. In general we think a US dollar per pound of food is a good price for canned fruit, vegetables, soups, seafood, and meat. A dollar a pound for pasta is good. Ditto for a liter of juice. 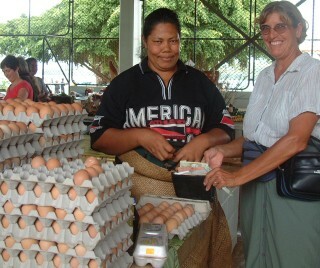 Prices in Tonga and Fiji are often 2X to 3X that. Rice and flour should be way under that, maybe 30 cents a pound. French Polynesia, for example, has subsidized flour, butter, rice, beans, etc. so you can actually eat fairly cheaply there if you don’t go to restaurants. When we left Fiji we had a tricky provisioning scenario. Australia confiscates many food items so we wanted to take just enough frozen meat, dairy, and fresh produce to last us but we didn't want to run out of things in New Caledonia, which is French and reportedly expensive. This was sort of reverse thinking from previous provisioning where we tried to take as much as possible!